336 pages | 4 B/W Illus. Recent advances in technology have dramatically altered the manner in which organizations function, transforming the way people think about and perform their work. The implications of these trends continue to evolve as emerging innovations adapt to and are adapted by organizations, workers, and other components of the socio-technical systems in which they are embedded. A rigorous consideration of these implications is needed to understand, manage, and drive the reciprocal interplay between technology and the workplace. 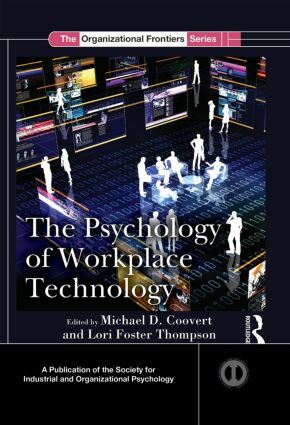 This edited volume brings together top scholars within and outside of the field of industrial and organizational (I-O) psychology to explore the psychological and organizational effects of contemporary workplace technologies. A special section is included at the end of the book by four experts in the field entitled Reflections and Future Directions. Michael D. Coovert joined the industrial-organizational psychology faculty at the University of South Florida (USF)and founded the Center for Psychology and Technology. His research includes human-systems integration, the impact of technology on individuals and organizations, quantitative methods, and performance measurement. Dr. Coovert has over 100 scientific publications, 175 presentations, and has directed 40 funded projects. He has received the Presidential Excellence Award from USF and also received the university’s Jerome Kirvanik Distinguished Teacher Award given once a year to its outstanding teacher. As an aviation enthusiast and pilot, Dr. Coovert can often be found in the sky. Lori Foster Thompson is a professor of psychology at North Carolina State University, where she leads the IOTech4D lab devoted to research at the intersection of work, psychology, technology, and global development. Her scholarship focuses on how technology and industrial-organizational psychology can together enrich and improve work carried out for, with, and by people in lower-income settings, for the purpose of addressing the most pressing economic, social, and environmental challenges facing our world today. In 2010, she was appointed an EU Erasmus Mundus Scholar in Humanitarian Work Psychology. She has been inducted into North Carolina State University’s Academy of Outstanding Teachers and in 2012 was named one of the university’s 24 inaugural University Faculty Scholars. Besides this book, Lori has edited a new book from Routledge (2013) with Julie Olson-Buchanan and Laura Koppes Bryan entitled Using Industrial-Organizational Psychology for the Greater Good. Launched in 1983 to make scientific contributions to the field, this series has attempted to publish books on cutting edge theory and research derived from practice in industrial and organizational psychology and related organizational science disciplines. The goal of the series is to inform and stimulate research for SIOP members (students, practitioners and researchers) and people in related disciplines, including other subdisciplines of psychology, organizational behavior, human resource management, and labor and industrial relations. To propose a title, please contact Christina Chronister (christina.chronister@taylorandfrancis.com).